Police officers with their guns drawn hear a second explosion at the finish of the Boston Marathon -- after the first explosion knocked down a runner. 9 a.m. ET — Race officials, competitors and onlookers observe 26 seconds of silence at the starting line in Hopkinton, Mass., west of Boston, in honor of the victims of the Sandy Hook Elementary School shooting. 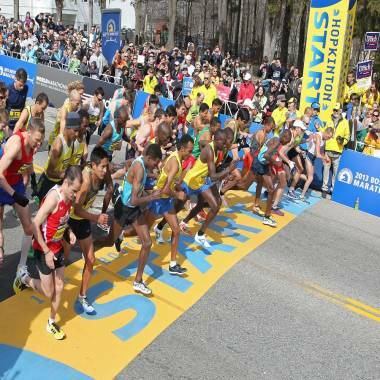 The elite men start the 117th running of the Boston Marathon. 9:17 a.m. — Fifty-three wheelchair competitors start the 26.2-mile race, on their way to the finish line at Boston’s Copley Square. 9:32 a.m. — Fifty-one elite women runners set off. 10 a.m. — The elite men and other top male runners — a wave of 3,000 — begin their race. 10:10 a.m.-10:40 a.m. — The remainder of the field of about 24,000 runners leaves in two waves. 11:58 a.m. — Kenyan Rita Jeptoo crosses the finish line as the women’s winner. Her winning time was 2 hours, 26 minutes, 25 seconds. 12:10 p.m. — Lelisa Desisa of Ethiopia finishes to become the men’s winner. His winning time was 2 hours, 10 minutes, 22 seconds. 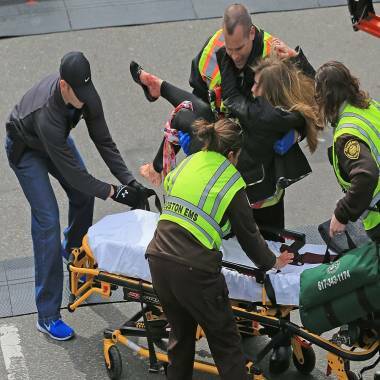 2:50 p.m. — As thousands more runners run down Boylston Street toward the finish line, two explosions erupt, about a block apart and within about 8 seconds of one another. 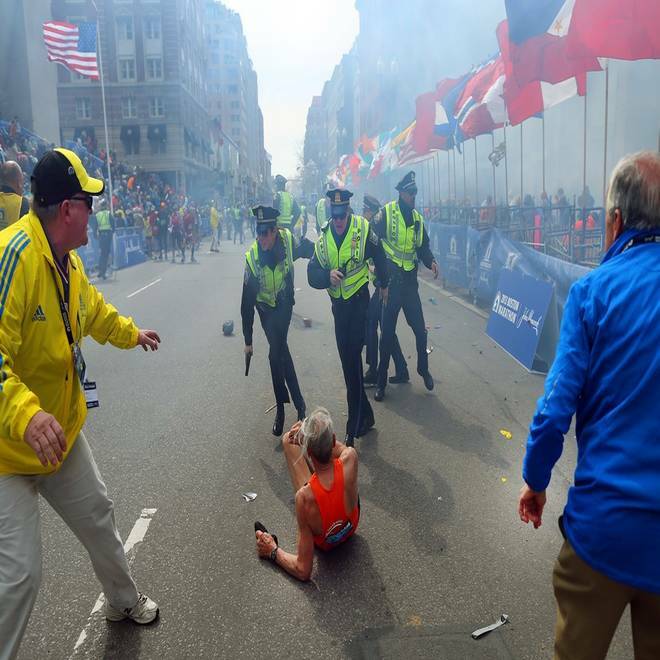 2:51-2:59 p.m. — Race volunteers and emergency workers on the scene rush to the aid of wounded spectators. A medical tent set up to care for fatigued runners is converted into a makeshift trauma clinic. Billowing gray smoke rises above a running gear store that overlooks the end of the marathon course. 3 p.m. — Boston police report an incident at 673 Boylston St. in Boston, but do not say what it is. Boston police, fire and other emergency crews respond. Marathon headquarters at the Fairmount Copley Plaza Hotel near the finish line is locked down. 3:30 p.m. — Reports and images from the scene begin to circulate on social media, including some graphic photos. 4 p.m. — Law enforcement sources tell NBC News that small homemade bombs caused the explosions. 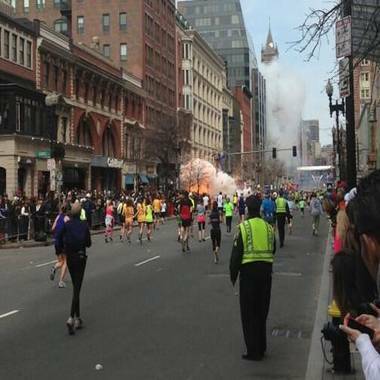 4:10 p.m. — Boston officials report at least two people are dead and at least 100 other people injured, including some victims who had their legs severed; senior U.S. intelligence officials tell NBC that another undetonated bomb was found near the finish line; the FAA restricts flights around Boston’s airspace and halts all flights in and out of Boston’s Logan International Airport. 4:12 p.m. — Police report a third blast near the JFK Library in Dorchester, Mass., about five miles to the south of Copley Square, but say it caused no injuries. First responders help the injured from the scene. 4:30-5 p.m. — New York City, Washington, D.C., announce increased security. Pennsylvania Avenue next to the White House is closed to pedestrian traffic; a White House official, speaking with NBC News on condition of anonymity, says attack is being treated as "act of terrorism." Boston Police Commissioner Edward Davis says each of the two blasts had multiple casualties. He urges people to stay inside and not gather in large groups. President Barack Obama calls Mass. Gov. Deval Patrick and offers federal resources to assist in the investigation. The JFK Library reports that a fire in the building is out, and that it had appeared to have started in a mechanical room. Police Commissioner Davis now says that the fire does not seem to be related to the bombings. 5:42 p.m. — Flights resume at Boston's Logan airport. 6 p.m. — Officials tell NBC’s Jim Miklaszewski that Boston PD officers are "guarding" a wounded man at a Boston hospital as a "possible suspect." 6:10 p.m. — President Obama addresses the nation and offers condolences to the victims in Boston. "We will find out who did this. We'll find out why they did this," he says in a 3-minute statement. "Any responsible individuals, any responsible groups, will feel the full weight of justice." 6:30 p.m. — An 8-year-old is reported to be one of the two people killed in the twin blasts. 8:55 p.m. — Boston Police Commissioner Ed Davis announces the death toll rises to three in the Boston Marathon explosions. 10:20 p.m. — Police confirm two explosives, each of which contained BBs or ball bearings that functioned as shrapnel; be-on-the-lookout alerts are issued for a man seen leaving the blast scene in dark clothing and a hood as well as one for a rental truck seen attempting to enter the area near the finish line.